If you are looking for ways to improve your productivity, reduce energy consumption or reduce melting loss or design an entirely new melting & holding system, we can help you. - Acid proof brick lining using epoxy material for better sealing and protection. We are engaged in provide Refractory Lining Services to our client at reasonable price. 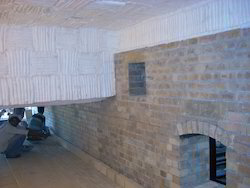 With huge clientele assistance and industrial understanding, we are engaged in offering Refractory Bricks Lining Works. Rendered beneath the supervision of highly trained professionals, these are largely commended all over the country. Moreover, our economical rates make these highly liked. We bring forth our vast industrial experience and expertise knowledge in this domain, offering Refractory Lining Services to customers. Our service range is widely demanded in aluminum, chemical, rolling mills, boiler and fertilizers industries. Being an eminent company, we are involved in rendering Boiler Refractory Lining Work. With keen commitment towards obligation, we are keenly immersed in the business of presenting to our customers world class Electric Furnace Lining Services. Widely applauded and cherished for their exactness, these services are highly acclaimed. As well, our ability to modify our services as per the varying desires of our clients makes these a favored market choice. We are occupied in rendering Refractory Lining Service to our customers. These services are widely appreciated amongst our customers due to their timely completion and reliability. Moreover, we are rendering these services as per patron’s demand in proficient way.